I first got interested in vintage Hamiltons back in 2009. There are so many models that I thought I'd try to focus on a specific genre of models. I decided to focus not the CLD ("sealed") line because there are only 15 manual winding watches plus three more automatic models. Seemed to be pretty doable... no? There are a couple of CLD models that are exceptionally scarce and several are solid gold and, therefore, rather expensive. So I decided to focus on everything and anything. I recently landed one of the more obscure models, the 1953 Kingdon. It was only produced for a single year. The CLD models all featured a series of gaskets intended to seal out moisture and dirt. The watches weren't "water proof", just sealed. One of the other common features of the models is the manual winding models all ended with -don. 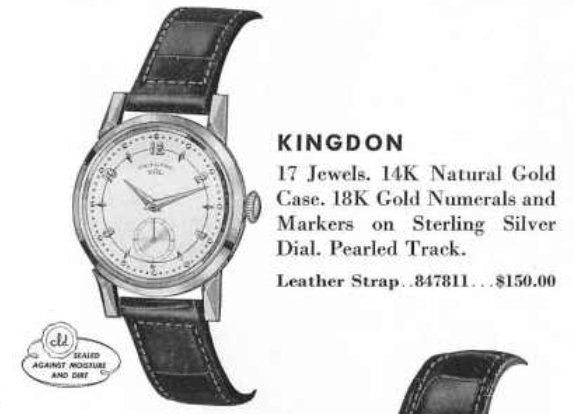 The Kingdon is one of the more obscure models and not seen very often. In fact, I've seen at most three of them in my time collecting. The model features a 14K yellow gold case. Tucked inside the two-piece case is a sterling silver dial with solid 18K numerals and markers. Behind the dial is a 17 jewel 747 movement. My Kingdon project watch arrived in typical condition. My biggest concern with it was the crystal - several of these CLD models all share the same crystal... the Croydon, Haddon, Kingdon, Lyndon, and Reardon all share the same crystal and they are scarcer than hens teeth. With the bezel removed you can see the movement and dial come out the front. The stem is a two-piece design that is intended to separate when the joint is aligned properly. The dial in my Kingdon is in fair condition. It might clean up a little but it would be a good candidate for refinishing if the right pattern exists. This is a complicated dial with the printing and the pearlized track of recessed gold-colored dots. The 17 jewel 747 movement is a fine American-made Hamilton. It arguably the easiest and most straightforward movement to work on. The crystal has some significant scratches that will be hard to polish out. I happened to find out that GS actually made crystals for these models. They aren't shown in the GS catalog though. A PA435 is a drop-in replacement for these CLD models. Hamilton often made it easy to identify models but stamping the name right into the case back. Unfortunately they didn't do it all the time for all the models. The movement already has a nice white alloy mainspring so I will just take it out, clean it and then reinstall it with fresh grease. Everything is cleaned, dried and ready to be put back together. The movement is reassembled and happily ticking away. Next stop is the timer. Originally running a little fast, a quick adjustment of the regulator slowed the beat rate down to just 6 seconds fast per day. I'll leave it there. Everything goes back together and a new old stock pigskin strap completes the restoration. The dial is still is "fair" condition. It's not horrible but I'm going to look into getting it refinished nonetheless. Still, it's not too bad as is and for such an uncommon model, perhaps I will leave it as is. UPDATE Aug 22 - Well, I decided that the dial really ought to be refinished since the rest of the watch looks so good. This is a very complex dial to redo though - lots of printing that needs to be perfectly aligned and a golden pearlized track. My friends Robert and Elizabeth at International Dial came through though. It took several months but I'm very pleased with the results. I happened to have a nice vintage genuine alligator strap to pair with it. I think it looks fantastic. What do you think? Thanks for the information. I was looking for a crystal for my 1953 Haddon.This post was the only one I've found so far that gave me the necessary part number for it. You have my gratitude. I like the pigskin band a lot more than the Alligator. A nice authentic pigskin strap is tough to beat. A vintage reptile skin is sharp too. I like to match band color to my shoes and belt and I don't have any pigskin colored shoes or belts though.